I have been asked many times, why fly around the world alone in a light aircraft? There is no easy answer. Why do mountaineers want to climb Mount Everest? Because it is there, because it is the highest, because it is their ultimate challenge. I think, it is the same with navigators. After going further and further, they seek the ultimate: a journey around the world. Whether it is sailing a boat or flying an airplane, the challenge is the same. Who is the navigator who never had this dream? I think, each of us, has wanted one day or another, to go to the limits of his abilities, to the limits of what he can do. Whether to see how far he can go, or to prove to himself, or to others, that he can do it. Why did I fly, alone, around the world? Well, simply because I had to do it. My aircraft, VH-XRD, is a Piper Aerostar 602P with the 700 conversion and most of the Machen improvements. The Aerostar is a mid-wing twin engine aircraft. It was designed by Ted Smith and built by the Piper Company. It was intended to be the fastest piston twin in the world, and still is. At 65%, it normally cruises at 240 knots or 450 km/h. With it, I have established several World Speed Records, the fastest being between Perth and Adelaide at 275 knots (508 km/h) and between Perth and Brisbane at 259 knots (480 km/h). The best record was 315 knots (584 km/h) between Perth and Forest. The normal fuel capacity is 205 USG (780 litres) giving a range of 1000 nautical miles (1852 km) at normal cruise power. To break or establish speed records, the aircraft burns a lot more fuel, therefore, covers shorter distances, and more refueling stops can be required. As the normal fuel capacity was not sufficient to cross the Pacific Ocean, I had to build ferry tanks. The Aerostar has been designed for high speed at medium range, that is, to cruise at 240 knots (450 km/h) between FL180 and FL200 (6,000 and 8,000 metres). To cross the Pacific Ocean, which is 2,100 nautical miles (3,800 km), other performances where required. I had to find what would be the engine settings needed to fly that distance with the fuel I could take on board. Everybody knows that a car uses less fuel when it travels slowly. That is also true for an aircraft but the difference is that below a given speed an aircraft does not stay in the air ! For the aeronautical minded, I had to find a compromise between the lowest induced drag coming from a high angle of attack (and this due to the low speed) and parasitic drag due to a higher speed. After many tests, I found the lowest speed not creating too much induced drag was 140 knots at full load, 135 knots at mid-load, and 130 knots toward the end of the flight with a lighter aircraft. Then, I had to find the engine settings to achieve those speeds at the different weight configurations. 26 inches MAP, 2100 RPM and 18 USG at the end of the flight with lighter weight aircraft. Take off was always done at full power with 42 inches and 2450 RPM, burning a huge fuel burn of 42 USG. I used to reduce power as soon as it was safe to do so, and would normally climb at 75%, that is 36 inches, 2400 RPM and leaning to 31 USG. I consider that it is the maximum continuous power possible, and it is what I used in my speed record attempts. 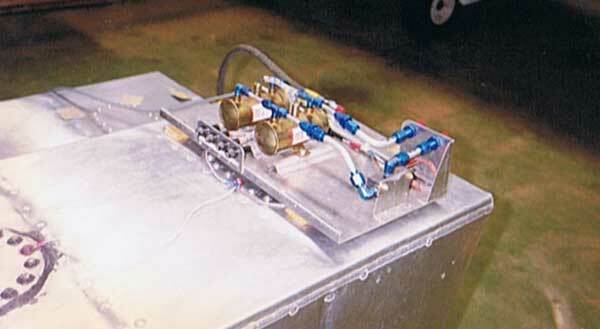 The fuel burns indicated are per engine. The low RPM should give both a better efficiency to the propellers, and also a better volumetric efficiency to the engines, and less internal friction. Finally, the ultimate calculation is to know how many miles can be flown with a gallon of fuel. I did that calculation every half hour. In the beginning of "the long leg", the figure was about 5.6 miles per gallon. If that figure had stayed there, I would never had made it, but as the aircraft was getting lighter, the figure went to 6, and then, at the end, to 6.2. As I was flying eastward, flight levels were 'ODD'. The 'long leg', between Hawaii and California, was flown at FL190. The other legs were flown at FL190 or FL170, but the legs in the Indian Ocean (between Oman and Madras, and between Madras and Penang) were flown at FL150. The only legs flown VFR were those in France because of my radio problems between Poitiers and Ostend with a stop at Lille. 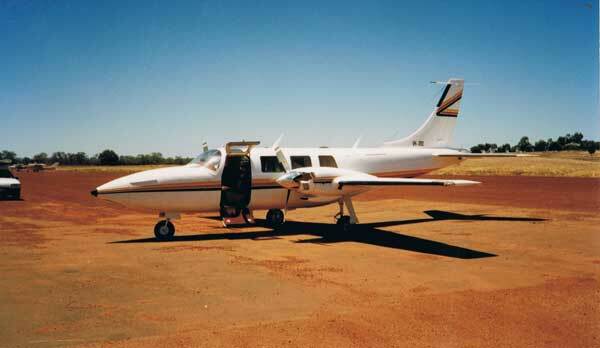 I started on May 15th, 1996 from Northam in Western Australia, where the Aerostar is based. 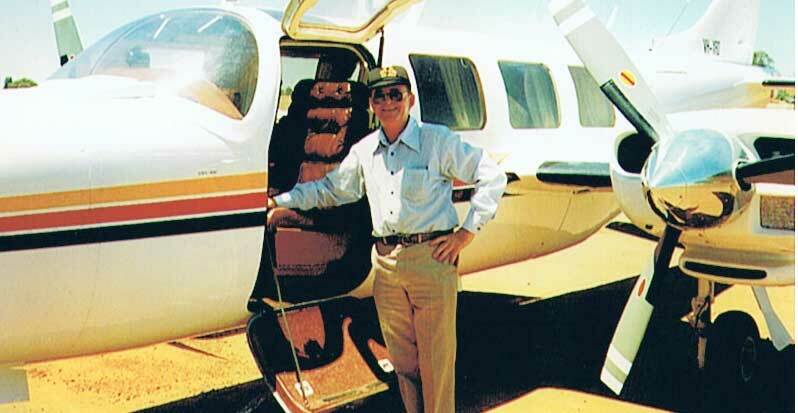 A non-event flight to Ceduna in South Australia. Another non-event flight, the next day, to Brisbane. Qantas booked me a spot on the tarmac of the new international terminal. They did help me with the Customs and refueling. All those legs, and all the way to Hawaii, will be flown at low speed. I could have flown faster considering the rather short distances, but I wanted to finalize my testing of the engine settings for the long leg between Hawaii and California. Despite all the tests I had done the last few months, I wanted to be positively sure of the settings, MAP, RPM, fuel burn, EGT. As I was moving along, the numbers were confirming the tests and that I could cross the Pacific with the fuel I had on board. Friday, May 17th, another flight without trouble to Noumea in New Caledonia with a landing at Tontouta Airport. I had left Brisbane with my Australian passport, but I showed my French passport here. The rest of the trip will be done with the Australian passport, until entry into Europe through Scotland. Tontouta is the international airport, but it is situated some 60 km from Noumea. In contrast, Magenta, a smaller domestic airport, is located in the middle of Noumea and is far more convenient. One thing that will follow me all along the trip is to arrive in a town or a country, and to find the town or country in the middle of festivities, with all hotels booked out. Here, it was the International Race of Polynesian Canoes. On Monday 20th, I flew back from Magenta to Tontouta to clear Customs on departure. Low overcast, but the tower gives Tontouta clear for VFR. However, half way, I was told Tontouta was closed to VFR, rain and ceiling at 600 feet. I changed to IFR, which meant an immediate climb to 5000 feet and an ILS approach. I had to make three missed approaches, before I could finally land in pouring rain. Refuel, customs, immigration and I was on my way for Nadi in Fiji. There, the Civil Aviation agent for air navigation charges, the airport clerk for landing charges, the refueller and the handling agent, advanced on me in force like vultures, with their calculators and their forms to fill and monies to pay... The hotel was just across the street and I walked there. On Tuesday 21st, I flew to Pago Pago in American Samoa. An easy flight with good radio contacts with my friend Eddy in Noumea on the amateur radio bands. A VOR approach with a quick circuit. Gordon, of Pritchard Airport Services, was waiting for me. 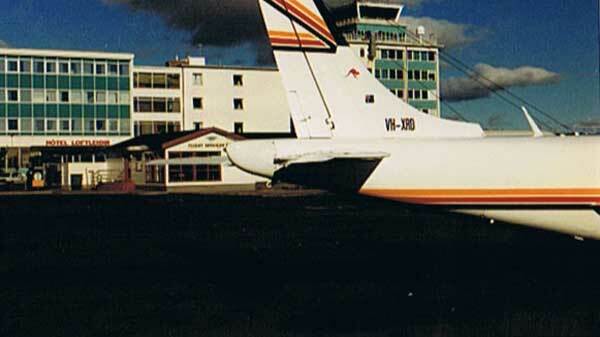 While refueling, a young Australian pilot saw the VH registration of the Aerostar and came for a chat. (Incidentally, many times, I will be asked where the "VH" letters come from, and sometimes I will have to repeat "Australia", as they where not sure of having understood it). This young pilot flies Twin Otters for a local air line; he comes from Perth in Western Australia and knows my Aero Club. When I said I was going to Christmas, he mentioned to me the Proctors will also be going there tomorrow. The Proctors are an American couple, who restored a Grumman Albatross, and they are flying around the world. I had followed their progress through Australia, but could never contact them. I tried to meet them here, but they were not at the Albatross. I thought it would be better for me to be at Christmas before them, as their huge Wright engines would gobble up all the fuel there. I decided to leave early and arrive at Christmas before them. So, the next morning, I had an early start, but as I arrived at the airport, surprise! The Albatross was taking off, with all the majesty of a large flying boat. I still had a chance to beat them at the fuel pump, the Aerostar being so much faster. But that was not to be, for, while I was ready to start, they came back. I asked Gordon to take me to their parking spot to see what had happened. They had lost an exhaust stack, and will have to wait for a week for a replacement from the States. I was invited to climb on board, as long as I took my shoes off. They have all the modern comforts, showers, kitchen, amateur radio equipment, etc... I left them, less concerned about the fuel. However, I was wrong to be worried ; fuel is abundant at Christmas. Refuelling at Chrismas Island from drums. I crossed the Equator and took a photo of the GPS showing only a few hundredths of a minute of North Latitude. Christmas Island (in the Pacific Ocean, not to be confused with the other Christmas Island in the Indian Ocean) is, as I was going to learn soon, the largest atoll in the world (234 square miles) with a population of 1,600. I did not see the whole of the atoll, only the Northern tip, where the field is located. After landing, at Cassidy Airport, I was greeted by the lady doing Customs and Immigration. Soon, the refueller appeared with his light truck and drums of fuel. They were Shell, rusted on the outside, but sealed, and the fuel was OK. In perfect English, he explained that the fuel stock pile is very large and there is no chance of running out. They can have up to one light aircraft a week. After refueling with a hand pump and paying in US currency, they took me to the Captain Cook Hotel. There, it was difficult to use the telephone as the power plan was erratic. At night, I had the surprise to see literally hundreds of American tourists coming to the dining room. They were "sport" fishermen. 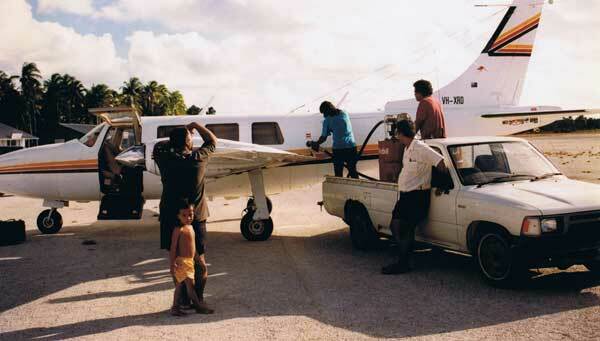 Once a month, they charter a Boeing to come to Christmas to catch Bonefish, so full of bones it is not edible. But it is very difficult to catch, and that is their sport. Then I landed at Hilo, an airport on the East coast of Hawaii, in order to be as close as possible to the Californian coast. The formalities were friendly, but thorough. It is here, that the Chief Custom Officer put June the 6th as my date of exit from the US. I did not know, then, I will have to wait for seven long days for the right wind, and that this visa would then be too short for me to visit the US at leisure. Next time, I will say I want to stay two months, just in case. Then, started a long wait for favorable wind and weather. I had done some research on the winds, between Hawaii and California, and I got from Bracknell, in the UK, what could be expected statistically on that route. They gave a 80% chances of westerly winds from the end of May to mid-June. But what we had, then, was just the opposite. A stable high pressure centre was well established between Hawaii and the Coast, creating Easterly winds right on my route. The centre was very stable and not moving at all. According to the weathermen in Hilo, this had not been seen for a long time. This system sent some bad weather and flooding inland in the US, as far as Montana and Wyoming. 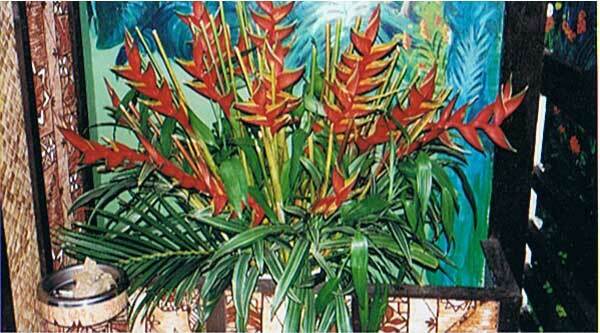 Flowers at the Hilo Bay Hotel, Hawaii. I was going every morning to the Weather Office, at the foot of the old tower, and every morning, the High Pressure was still there, not moving. I also got confirmation of the situation by using JeppFax, and they were showing the same picture. This took me most of each morning, and I had to fill the afternoons. So, I visited all the volcanoes (non active), all the museums, all the botanical gardens. The gardens were magnificent. The electric pump arrived from California. On Friday, May 31st, I got the weather by fax, as usual. The high centre was in the process of melting away. I got confirmation from another source. The weather pattern was returning to normality. Finally, I filled all the tanks, late in the evening to avoid heat expansion, and went to bed early. I had to leave in the early hours of the morning, in order to arrive in the afternoon to avoid early morning and late afternoon fog. The quarantine officer was already at the airport (there is quarantine control between Hawaii and the main land). I asked him to write down my take-off time, as I wanted to make a speed record attempt on that leg. It was 3.51 am, I lined up on the runway, turned the lights on with the VHF, and headed for California. That long leg had worried me for months, and yet, it turned out to be one of the easiest legs of the whole trip. I had done the calculations of fuel again and again. I had decided on a ¨Point of No Return¨ of four hours. That is, if after four hours, I had not covered one third of the distance, or if I did not have two thirds of the fuel left, I would have turned back to try another day. At intervals of 30 minutes, I had the figures for fuel and distance pre-calculated. All I had to do was to compare those figures with the actual readings, distances on the GPS and fuel remaining on the fuel computer. Right from the beginning, the margins were increasing, and after four hours, I knew I could make it safely. Eddy from Noumea kept me company all along, we had a chat every half hour on the radio amateur bands. Daybreak came soon, it was Summer, as I was now in the Northern Hemisphere. Communications on HF were very good, though it was sometimes hard to get a word in edgeways, as a lot of aircraft were reporting their positions, on the same frequency, at the same time. I had sometimes to wait up to five minutes to make a position report . HF communications were good throughout the trip. Finally, in the afternoon, the coast of America appeared in the haze. I landed at Santa Barbara, after 10 hours and 37 minutes. I still had two hours of fuel left! I quickly went to the tower to have the controllers sign my landing form for the speed record attempt. It was later ratified by the Federation Aeronautique Internationale in Paris as a World Record. The FAI is the international body to register all aviation records. The average speed was 360 km/h, not quite 200 knots. This is a new record and it will be a challenge for others to try and better. The FBO located a hotel for me. That was not easy, as every hotel was booked out. There, I could now telephone my family in Australia, and friends in Belgium, that I had landed. I had not told anyone of my departure, as they would all have been worried and would have been waiting for my call. The longest leg of the whole trip was now behind me, which was indeed a relief for everybody. The next day, a short flight to Van Nuys, one of Los Angeles satellite airports. Supposed to be the busiest GA airport in the world. That was made harder for me that morning, as a new control system was being put into operation with a lot of frequency changes. Nevertheless, I found my way through the traffic and landed without too much trouble. I parked in front of the Airtel, a Great Western Hotel located on the field. The next day, Monday, June 3rd, I had the oil changed, the oil filters replaced and my pump installation checked. I had a small oil leak on the left engine, but we could not find where it was. However, as the engine did not take any oil, I was not too concerned. The leak increased as I went along, making a mess of the left side of the fuselage, but not to the point of being a worry. I had to wipe it at every stop. The oil consumption, for the long leg, had been three litres for the left engine and four for the right engine. That night, I lost a front tooth ; that too will have to wait, till I get home, to be repaired. It was hot, around 32 Celsius and there were many bush fires in the hills. Approach to Boeing Field, Seattle. Finally, I had to leave and on Wednesday, June 3rd, I filed a flight plan for Seattle. First, I flew over California, with her fields, then over the Rockies. The tops were still covered with snow. I passed Mt. St Helens and Mt. Rainier. I landed at Boeing Field. Galvin, the FBO, refueled me and helped me find a motel for the night. Everything was very green, quite a contrast coming from California. The next morning, I filed VFR for Vancouver, but having too little local knowledge, I had to cancel and file another IFR plan, when I was given a clearance, I could not understand nor follow it. In a few minutes, I landed at Vancouver. It was overcast, with light rain and low clouds. Customs formalities were quickly done and I parked in front of one the nearest FBO. . As I stopped the engines, I could hear the right engine starter motor being jammed. I made a quick phone call to Al Hoover at Aerostar Corporation in Spokane to have a new one sent ASAP. It arrived the next morning, at 10 a.m., and in less than an hour, the exchange was done, but it was too late to go, so I stayed till the next day. Friday, June 5th, during the climb out of Vancouver, I had the fire alarm on the left engine. A quick check in retarding the left throttle showed it was not a fire, but a blown turbo gasket. I calle the tower and turned back. Despite my insisting that I was not in danger and that it was not an emergency, they closed the airport and called the 'big circus'. After landing, a brief explanation and all was OK. I had lost so many of those gaskets, that I always carry a dozen of them. 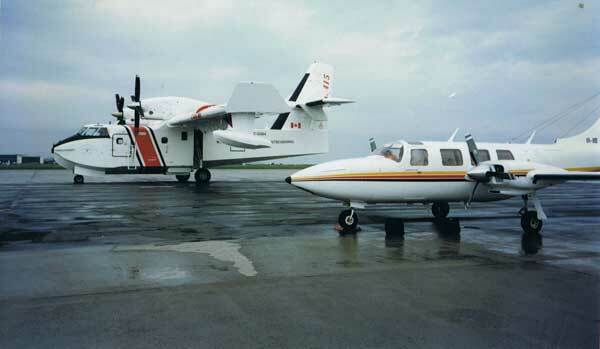 Goose Bay with a Coast Guard Bombardier. I flew over the Canadian Rockies, also covered with snow. Then it was the plains with wheat fields, laced with numerous lakes. I stopped at Brandon, a small town just short of Winnipeg. I overnighted at Thunder Bay, on the banks of Lake Superior. Lots of forests, timber mills and a pulp factory. It must be cold here in winter as there are lots of chimneys and many heaps of firewood. I left the next day. The weather was deteriorating. I could hear lots of aircraft diverting because of thunderstorms. I landed in a squall at Saint Hubert, one of Montreal airports. All hotels were full, because of the Montreal Grand Prix and I had to go as far as Longueuil to find a room. I spent a few pleasant days in Montreal. I met a radio amateur Pierre Decarie, known for a long time, but never met. Then I flew to at day. Goose Bay which is now a Canadian Air Force Base. The town is very much a frontier town with Esquimaus playing poker machines and juke boxes. A very interesting meeting with Canadair pilots. They were coming back from Europe, where they had demonstrated their fire fighting flying boat. They will give me excellent advice about Narsasuack in Greenland, which is my next stop and which was their last. Saturday, June 15th, flew to Greenland. Very cloudy, ice at all levels. It is hard to think of flying in those countries in winter. Approach to Narsasuak, at the South-East tip of Greenland, is known to be very difficult. The airport is at the end of a deep fjord full of bends. Jeppesen approach plates recommend not to attempt an approach through the fjord if the ceiling is less than 4,000 feet. The mass of land and ice of the continent creates an almost permanent cloud cover, sometimes very low. The normal approach, as per the plates, requires a very steep descent. According to the Canadair pilots I met the night before, it is safer to spiral down on the NDB holding pattern until visual. I found this easier than the steep descent and got visual at about 4,000 feet. 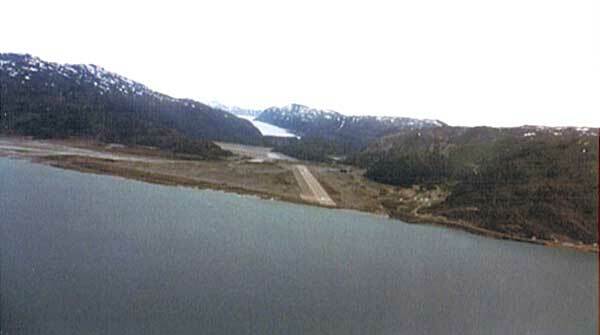 The airport is on the glacier's moraine, between the river flowing from the melting ice of the glacier and the side of the mountain. Landing is toward the glacier, and take off toward the fjord. When I went to the Office to pay for the fuel and landing fees, I was presented with "my" flight plan for Reykjavik and a weather forecast, and I was told the airport will be closed tomorrow, and the weather will be bad. I tried to explain I wanted to stay overnight, and then, I remembered stories told by the Canadair pilots the night before at Goose Bay, that all the personnel occupy all the rooms of the hotel and they do not want to be disturbed, especially on a Sunday! As it was only 2 Pm and considering the lukewarm welcome, I decided to continue to Reikjavick in Iceland. The cloud cover disappeared as soon as I left the continent's land and ice mass. Rather fair weather until the last 30 miles. I landed at Reikjavick in light rain at the minima. The FBO offered his services. I had planned to stay at the Loft Hotel, just behind the tower, but it was fully booked. This was the long week-end of Independence day. It is the peak of Summer and as we are so close to the Arctic Circle, the sun is below the horizon for only a short period and there is no darkness. I had some jet-lag, having crossed many time zones in a short time, so the next day was a rest day. I left Iceland in rather good weather. The countryside was green. A contrast with Greenland, barren and icy. The two names certainly do not reflect the look of the two countries. After getting through the cloud cover, I flew over the Scottish countryside, very undulating and green, with shrubs and bushes in flower, yellow broom and white mayflower. With a friend from Belgium, we toured that part of Scotland north-west of Glasgow. The countryside is beautiful, very green. Wild rhododendrons were in full flower along the roads and in gardens. Food was excellent, very fresh. We enjoyed the local sea food immensely. We toured that part os Scotland and went all the way to the magnificent castle of Inverrary. On Friday, June 21st, we left Scotland for Belgium and on Sunday, June 30th, I flew from Ostend to Toussus-le-Noble, one of Paris secondary airports, where my radios were to receive the 25 kHz kit necessary in France. Time went very quickly, visiting friends and relatives, castles and museums. On July 29th, my friend and I, we left Ostend for Nice on the Mediterranean Coast. Nice was going to be our port of exit out of Europe. And on Thursday, August 1st, we left Nice, not without difficulties, as we had a flat battery. Somebody must have left the master switch on ! We flew over Corsica and followed the Italian coast. We saw a bit of Naples and its famous bay. Then a short, but very expensive, fuel stop in Crete. And finally, we arrived in Egypt. The Nile delta is green, every bit of space is cultivated. Approach to Cairo in a sand storm. Then Cairo, very dry, and dusty. It is a very large city, with 17 million people, the same population as the whole of Australia. Thousands of little square houses with flat roofs. We received a lot of conflicting instructions from the controllers, but eventually, we found the airport and landed without too much trouble. We visited the Cairo Egyptian Museum. Very large, very rich. We reached saturation long before having seen every item, so we retreated to see Ramses sarcophagus before quitting. Those sarcophagus are all in gold and precious stones, and have to be seen, as no photos can give justice to the perfection of the design and the quality of the workmanship. It was hard to get close enough to have a good look, as so many Japanese tourists wanted to have their portrait taken in the company of Ramses. Saturday, August 3rd. With the guide of our custom-made tour, a charming and well educated lady, speaking good French, we visited the Great Mohamed Ali Mosque, looking very much like Sainte Sophie in Istanbul. We visited the Pyramids. I was surprised to see them so close to the townsite. Most photos are misleading, they never show the houses and the township. The pyramids are huge, but one only measures their size when confronted with them at close range and looking at the first row of stones. It is enormous and it is impossible to grasp the enormity of the task of building them, especially at the time. 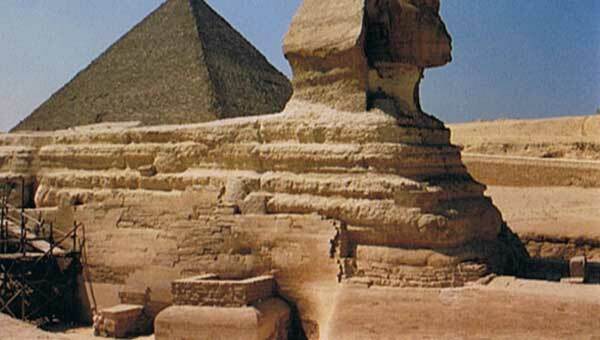 The Sphinx is next to the Pyramids. It has been cut from the rock bed and its base is underground. It has suffered damage by weathering as the rock is very soft and by the Mameluks (Arab warriors) who used it for shooting practice, and unfortunately must have been shooting straight, as they broke its nose. The Great Pyramid and the Sphinx. Sunday, August 3rd, we took an Air Egypt Boeing 737 for Luxor where we boarded the "Nile princess" for a cruise on the Nile. Finally we reach Aswan, the end of the cruise. We had a glimpse of the High dam and Lake Nasser, under heavy military surveillance. We visited the temple of Philoe. This temple had been flooded years ago when the first lower dam was built. However, it has now been moved to another island, high above the waters. We left the "Nile Princess", and spent a night at "The Old Cataract Hotel", just across Elephantine Island. There too, a very old fashion hotel, very spacious and very comfortable. Then back to Cairo with Egypt Air. It is difficult to describe Egypt without plagiating tourist books. One can only say, it is a must to see the remains of one of the greatest civilizations. It is very difficult to think of the efforts required to build all those temples, etc�, and to compare with the Egypt of today. Monday, 12th. First preparations, we order a weather forecast and file the flight plan with Nile Valley Aviation. Tuesday 13th, my friend boarded a Sabena flight for Brussels and I made my way to Bahrain. I had the feeling the trip was over, and all I had to do was to go home. This was a false impression, as I still had one third of the way to go. In fact, what was in front of me will prove to be the worst and the most difficult of the lot. Worries started as I had to back track to Alexandria for fuel, because Cairo no longer has Avgas. There, my two VHF adios, modified to have the 25 kHz channels, stopped working. I could hear, but I do not transmit or the transmissions are unreadable. In Alexandria, I gave the radios a good shake and they seem to work. But not for long. On the leg to Bahrain, the problem was still there, I could hear, but they could not hear me. That was to last all over the Middle East, making those legs very hard and stressful. Landed without problems at Bahrain, as the radios seem to work occasionally. The handling provided by Bahrain Airport Services, which seems to be part of the airport itself. Architecture here is very much Muslim and it is easy to feel how rich the country is. Everything is large, new, clean and everything works properly. The next day, because the next leg to Oman is short, I took the time to have the radios checked by an American technician. We took them off, and put them back after cleaning the contacts in the rack. They worked OK, but for how long? Seeb is the international airport for Oman, of which the capital is Muscat. Slightly less opulent than Bahrain, but the same beautiful Muslim architecture. After take off, during the climb, another fire alarm warning , but this time on the right engine. After a very quick check, it is a turbo gasket again, like in Vancouver, and fortunately not a fire. I turned back, insisting it was not an emergency. But contrary to Vancouver, there will be no fire trucks. I called Oman Air Services on the VHF and they found an expatriate Indian engineer to help me change the gasket. After an early night, I left for Madras. Radios were now working most of the time. The countryside around Madras was very green and lush, a striking contrast with the desert around Muscat. Handling was done by Indian Airlines. They were OK and refueling was quickly done. But from now on, I was going to experience Indian bureaucracy. My agent will take me from office to office to fill a multitude of forms, without end or aim. The offices are located all over the airport. I think, someone, without a vehicle and without knowing where those offices are, sometimes hidden in derelict buildings, would have to spend days finalizing all the formalities. All those forms are to be registered in large books, signed and re-signed, stamped and re-stamped. It has reached a stage where the officers themselves probably do not know why all these forms are necessary and what they are for, and if the stamp has to be on the right hand side instead of the left hand side. It will take four hours, and, when I asked if we could do the departure papers for the next morning, I was told that it was out of question. It was dark when we finished. What followed was a long drive in the night in a mad taxi through mad traffic. There are six rows of cars when there are only three lanes painted on the road. We finally arrived at the Sheraton, where I had to fill a few more forms, including one to change 20 dollars for the taxi the next morning. I got in bed at midnight, worn out. Got up at 4 am, filled another form to check out of the hotel and another mad drive back to the airport. There, I could not find the agent, but he found me, highly visible with my bright uniform, cap and golden shoulder pips. And we started again the office circuit, but in the reverse direction. It will also take four hours and I will finish in the Air Force office for the last stamp and signature. I am keeping, the flight plan with no less than nine signatures and stamps. It was with relief that I closed the door of the aircraft and started the engines. I had heard many stories on how intensive was the red tape in India, but I could not believe it could reach such a degree. This is why, in order to avoid more than one stop in India, I forced myself to make two very long eight hour legs. I still think it was the right thing to do, as I could not have taken another remake of the same. -You are all wet, go to your hotel and come back tomorrow for the custom papers. Coming straight from Madras, I could hardly believe it! I was back in the civilized world! I took a day off, went to the airport to do the custom papers, paid the landing fees, refueled and filed the flight plan for the next leg. The briefing office is on the 9th floor of the tower and the lift was out of use. Penang is located on an island and is linked to the mainland by a long bridge. Not far, is the Australian Air Force base of Butterworth. On Monday 19th, short flight to Seletar. It is one of the secondary airports of Singapore. Most GA is directed there. They have Customs and Immigration. Global Aviation was expecting me. . They have a radio technician. I explained my radio problems. The next day, another short leg to Bali. The agent there, Mr. Dude, a retired ATC controller that I have used several times, recognizing my name on the flight plan, went to the tower to welcome me by radio. That was nice. He has already done all the paper work and he drove me to the Hotel Bitang not far from the airport. Then, the last overseas leg to the continent. Port Hedland has no Customs Officers permanently based at the airport, so, some officers must come from the harbor when an aircraft arrives from a foreign country. My sister had notified them of my arrival at 3 Pm. I made a point of arriving on time. The quarantine man was also there with his spray can of insecticide. But I had already sprayed the aircraft on top of descent. I handed him my empty can and he was happy. But the two over zealous female customs officers searched each and every piece of my luggage. It is the first and only time during the whole trip that my luggage had been searched. Finally, on August 22d, the last and final leg home. I had said I would land at 3 Pm and adjusted my speed to be on time. There was a lot of icing, I was back in winter time. What I did not know, was the surprise reception organized by the AeroClub. Two or three persons were waiting outside my hangar, with the rest of the troops hiding inside. The idea was to make me believe only very few people came to see me arrive. Soon, as I cut the engines out, the doors open and they all came out, yelling and shouting. They had decorated the hangar, and even washed my car. There was a lot of champagne and we drank it all. There were also some journalists, asking the usual nonsense questions that only journalists can ask. It was all very pleasant and it very nicely finished off the trip. So finished an interesting, challenging, and enjoyable experience. I made a beautiful journey and I am very satisfied with myself and my aircraft. I am happy of having done this flight around the world. I have done it with great pleasure and I am glad I did it without any great hiccups, with the satisfaction, at each stop, of having done the right thing. It has not been easy all the time. I had mechanical problems, radio problems, annoying red tape in India and some bad weather. I think such a flight is within reach of most pilots. A lot of determination and good preparation are the keys to success. When one has decided to front a challenge, one must persist and go all the way to the end. Success is then a great reward, but giving up, even before starting, is a defeat. I have been asked where I shall go next, what will be the next challenge ? At the moment, I am not sure, but, there are still many challenges to meet. The world is so vast and so interesting, and to fly is so fascinating. We were in 1998, when and where to have such a gathering? Hans suggested Oshkosh in two years time. We got in touch with Margi Moss, a British lady living in Brazil. She had, with husband G�rard flown around the World in 1992, being the first light aircraft crossing the South Pacific between Easter Island and Chile. With her help, we compiled a list of pilots and launched invitations around the World. Tom Pobersny of he EAA was very enthusiastic. The EAA offered a stand and they gave us a meal and a trailer of beer. Some 50 pilots joined. The EAA offered to give us a page on their Internet Site. Knowing what would happen, I declined the invitation wanting to remain independent. So, I offered to create an Internet Site as long as Margi helped with the writings as I liked very much her witty style. Hans came with the name �Earthrounders�. We all liked it and it was then adopted. At the end of this first gathering, Hans invited us to Vienna in 2001 during the centenary of the Austrian Aero club. It should be noted that Austria had an aero club well before the first flight of the Wright Brothers. The meeting was a success and it was decided to have regular meetings. I did host the next meeting in Perth in 2003 where five crew flew all the way around the World to attend the meeting. The next meeting was to take place in Brazil, hosted by Margi and G�rard Moss but as G�rard was flying again around the World in a Ximango motor-glider and Margi was holding the fort, so Gorge and Malu Cornish hosted the next meeting in Mexico. The next meeting was to be hosted by Frank and Dorice Heittlich in Capetown. Unfortunately Frank had a fatal accident, flying from Brazil to Dakar but Dorice and her daughters insisted in having the meeting as Frank would have wanted to have it. That was very brave. The next meeting took place in Brasilia where the Moss had moved. The next meeting as of this writing will take place in Florida, hosted by Bob Gannon. The �Earthrounders� group has grown in strength and in size. So does the Internet Site. It has now 150 pages and more than 1500 photos have been published. There are listings of all the known flights around the World, starting with the World Cruisers in 1924. There are also several pages of information on places around the World. Most of the information being supplied by Earthrounders in order to assist and help new comers. There is also a very comprehensive database of all the known flights. It is �searchable� by pilots and co-pilots names but also by any of the parameters (aircraft types, brands, routes, nations, etc.). Flights around the World are announced and followed on the Site. We have created an award for the best site describing a flight around the World and the Earthrounders Site has been awarded the �Best Aviation Site� award.